Product code: Q552 Categories: Sold Items, Sold Watches. 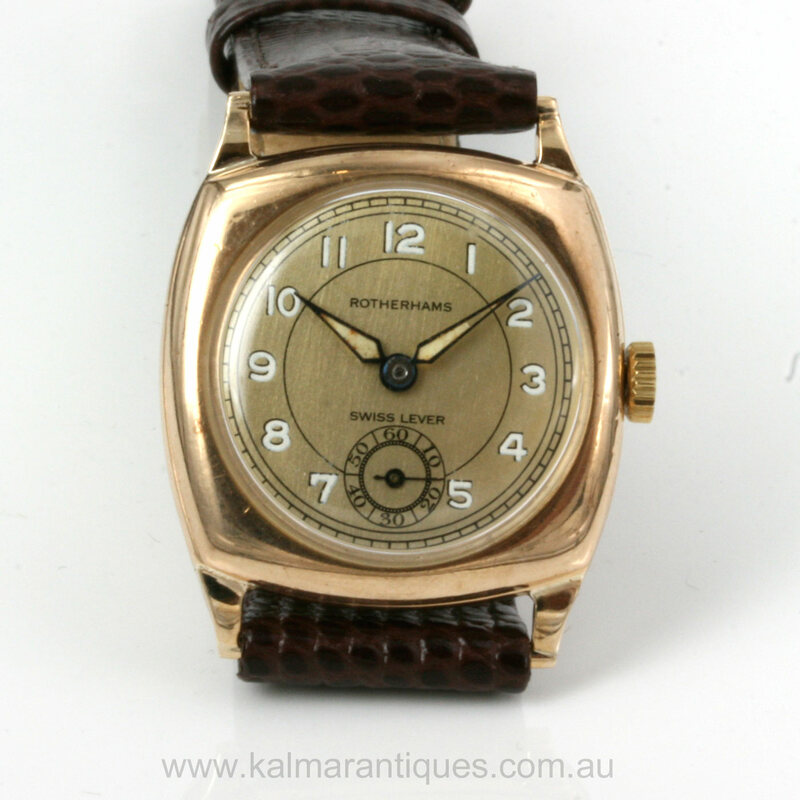 There is nothing quite like rose gold with its lovely warm colour about it that looks so good on the skin, and here is a very attractive 9ct rose gold vintage watch by Rotherhams. 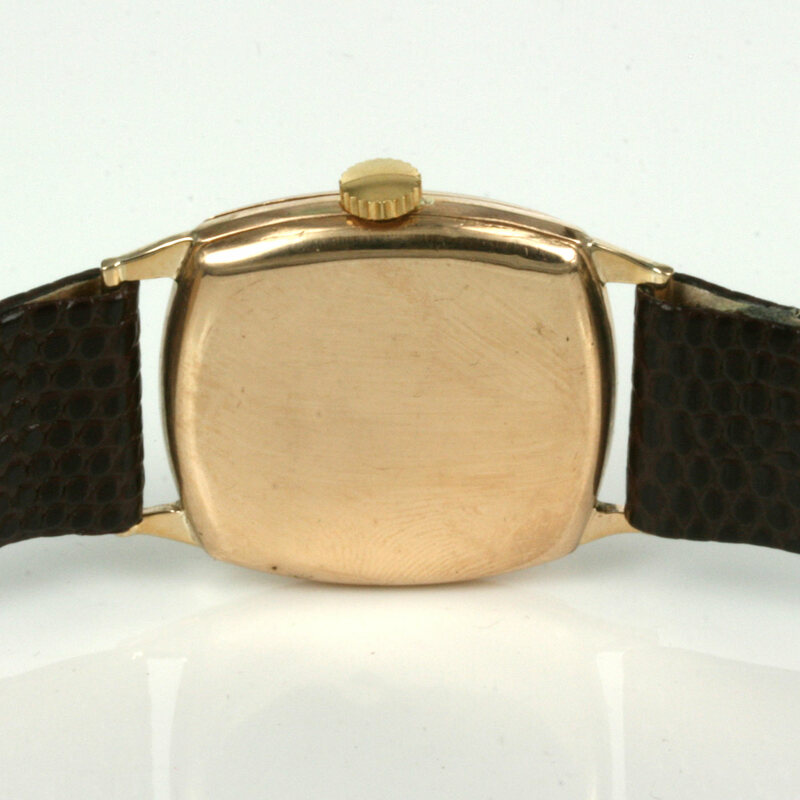 Made in the 1930’s the watch case has a lovely cushion shaped case that measures 29mm plus the crown across by 29mm or 36mm to the end of each watch lug that connects to the leather band. 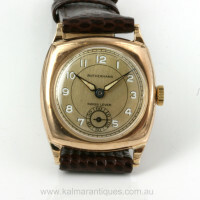 The colour from the rose gold is so attractive and not often found in watches today and looks so elegant. The dial of the watch has been repainted back to its former glory and is now so easy to read day or night and has the character of a vintage watch with the sub-seconds down the bottom. Inside the movement is a 15 jewelled manual wind Rotherhams movement that has been fully serviced and comes with our 1 year warranty. The colour of the watch case combined with the lovely dial all go to making this a very elegant vintage wrist watch that looks so good on the wrist and will always be admired and loved.